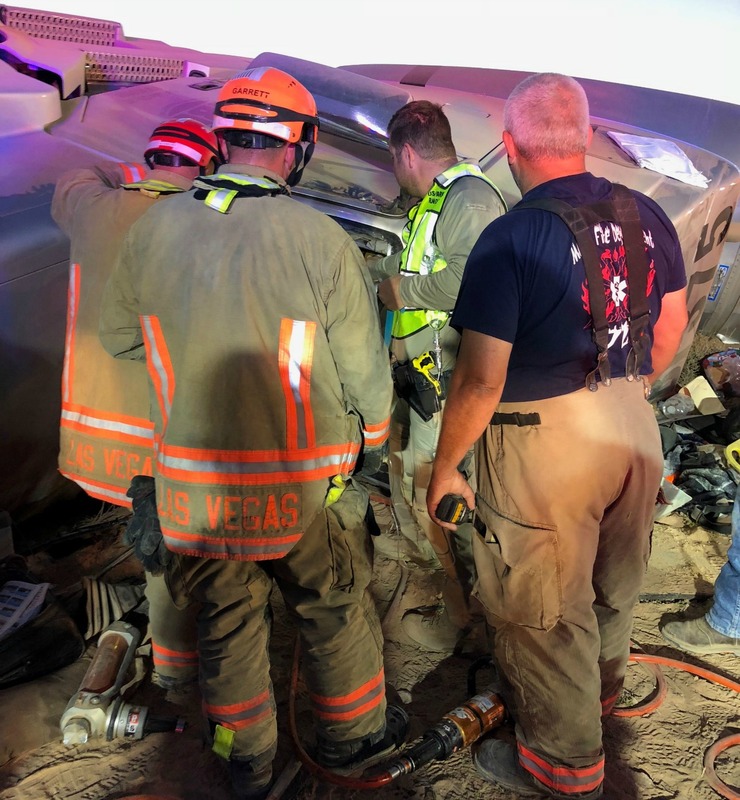 ST. GEORGE — Two occupants were trapped, one for nearly three hours, after a semitractor-trailer rolled over and crashed Tuesday off Interstate 15 north of Las Vegas, Nevada. The early morning a crash was reported on I-15 southbound near mile marker 98, just north of Moapa in Clark County, Nevada, Mesquite Fire Department’s Public Information Officer Ryan Thornton said. Troopers with the Nevada Highway Patrol and the Clark County Fire Department responded to the scene. Mesquite Fire and Rescue was also dispatched to provide mutual aid. Crews spotted a severely damaged semitractor-trailer to the right of the roadway with two occupants trapped inside of the truck’s cab. Firefighters found one of the truck’s occupants trapped inside of the sleeper compartment to the rear of the cab and were able to extricate the individual “fairly quickly” Thornton said. The individual was transported to the hospital by ambulance. The second occupant, possibly the driver, was a more difficult removal, he said, and after 45 minutes crews were still unable to free the individual. Fire officials then requested additional assistance from surrounding agencies, and the Las Vegas Fire Department sent heavy rescue equipment and crews to the scene. Nearly three hours later the man was freed from the twisted wreckage and transported to the hospital by ambulance. Details of the crash were not available at the writing of this report. It crashed to the right of the roadway? Aren’t all semi crashes supposed to be in the center divider so they can block ALL lanes of traffic?